Before the tourist flow will start, Carla, Man and Narrator visit the Begijnhof in Amsterdam. They are looking at the Sacred Heart statue in the middle of the lawn. 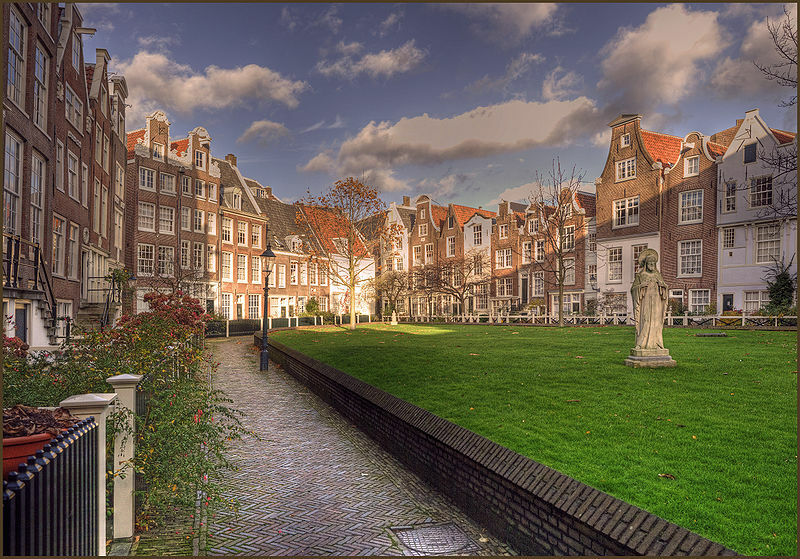 “This Begijnhof – founded before 1346 AC in the Middle Ages – is the only inner court that exist in the Amsterdam within the Singel. Originally the Begijnhof was entirely surrounded by water with the Nieuwezijdsvoorburgwal, Spui and Begijnensloot; the only access was a bridge over the Begijnensloot at Begijnensteeg. The Begijnhof was not a retirement provision founded by private individuals; it was a sort of nunnery – with patron saint St. Ursula – where beguines lived with more freedom. They had made a vow of chastity and they had felt obliged to daily visit Holy Mass and to perform prayers during fixed moment every day, but they were allowed to leave the inner court at any time to get married. 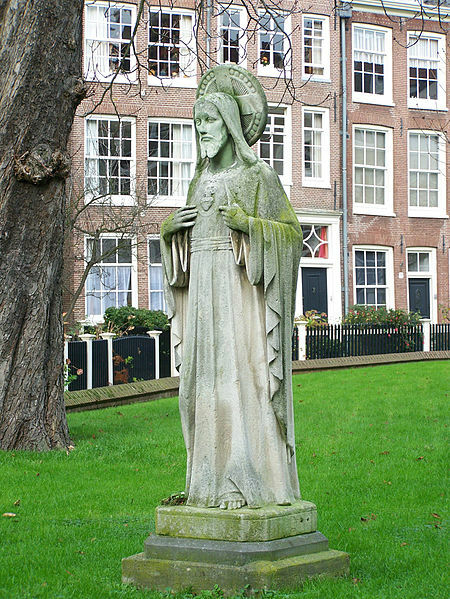 After the Alteration in 1578 AC – wherein the Catholic administration in Amsterdam was replaced by a Calvinist administration – the Begijnhof was the only Roman Catholic institution that was allowed to continue its existence because the houses were private property of the beguines. The chapel, however, was closed to be allocated in 1607 AC to the English Presbyterian church in Amsterdam. Since that time, the chapel is named the English Reformed Church . In September 1898, Piet Mondrian – an iconoclast in modern art – was commissioned to make four wooden relief panels for the pulpit in the English Reformed . 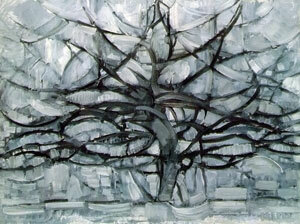 It is interesting to see the development in the work of Piet Mondrian; starting with these panels in the pulpit, via the painting of the tree in gray/blue, to abstract paintings with coloured surfaces, to – like Gerrit Rietveld – determine the painting with white, perhaps because he was one of the few who wished to create paintings by undistorted light. After his iconoclasm Piet Mondrian had kept to the strict rules of abstract paintings according Neoplasticism  and he only used horizontal and vertical lines to divide the surface of the painting; lines that enclose and lines that exclude, although in the last paintings both lines no longer enclose and exclusion. 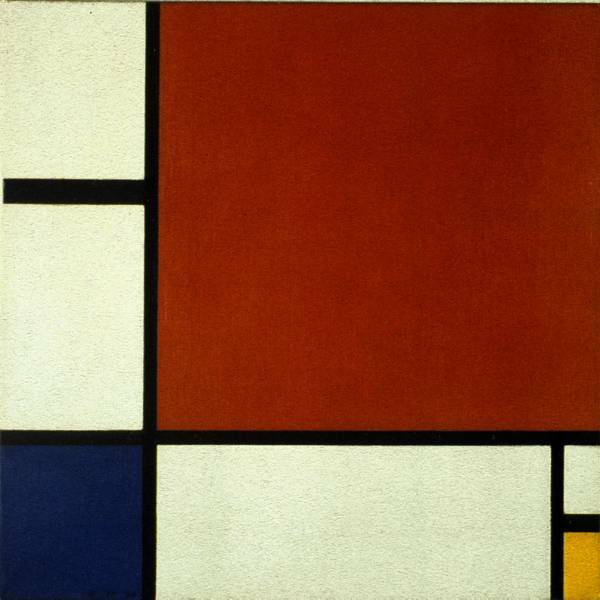 Piet Mondrian never used diagonal lines like Theo van Doesburg . Via this contemporary iconoclasm by “De Stijl” movement, it may be good to continue with your introduction of iconoclasm of more than 2500 years ago”, says Narrator. Carla, Man and Narrator sit against the wall around the lawn in the Begijnhof. “Thanks you for this fascinating introduction to the Begijnhof and its history. Before I will start with the iconoclasm of 2500 years ago in the early Jewish history, I would like to bring to mind Moses’ effort to get the One – Yahweh – recognised as the only God without a picture by the Jewish people. After Moses had receive the Ten Commandments from the One (written with the finger of Yahweh) – including the first two commandments: “I am the eternal God and Thou shalt have no other gods before me” – and returned again to his people, he saw the chosen people worshiping a golden calf: the chosen people had completely forgotten Yahweh. Furiously Moses threw the tables of the Ten Commandments in pieces. Hereafter he had to climb the mountain again to receive new tables of the covenant from the One. These tables were carried in the ark of the covenant; probably the ark was destroyed in the destruction of the first temple in Jerusalem . 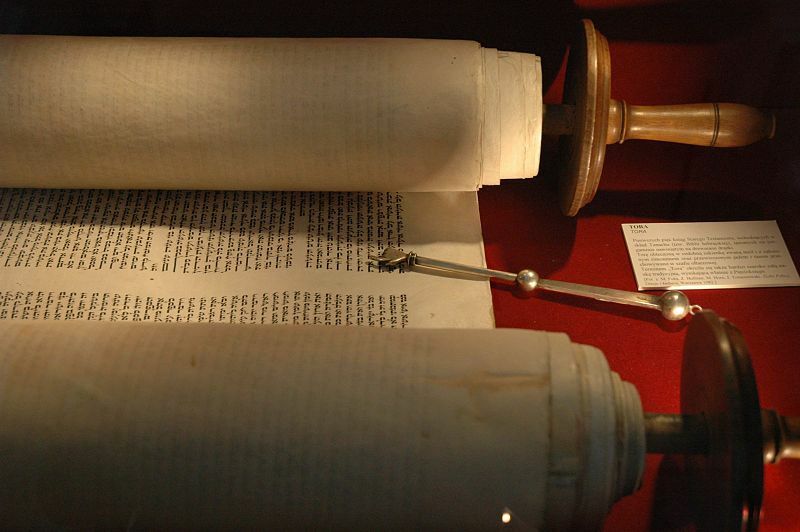 Since that time, the tables of the covenant including the first books of the Tanakh  are carried as Torah  by a Jewish community on a roll – made of parchment from the skin of a kosher animal – wherever they go. The text of the Torah is overwritten and copied by hand on parchment for every Jewish community wherever they live. Because of these roles the covenant with the One is no longer physically bound to the original tables in an ark of the covenant. Around 600 BC the first temple in Jerusalem – built around 1000 BC under the reign of King Solomon – had been destroyed and a large part of the chosen people had been taken to Babylon in three groups between 597 and 582 BC. A small group of the people had remained and they lived as shepherds among the ruins of Jerusalem . A generation later, the part of the chosen people in Babylon could return to Jerusalem, and many of them returned. With the group that had stayed behind in Babylon, a close relationship remained that almost two thousand years later is still in place, because after the chosen people spread all over the earth, the descendants of this group staying behind in Babylon were still consulted on the interpretation of religious matters. After the return of the exiles the rebuilding of the new smaller – second – Temple started in Jerusalem; this second temple had been finished in 515 BC. At that time, there was a high degree of literacy among the chosen people in Palestine; this is shown in correspondence between Jewish soldiers and their officers from that period . In 445 BC Jerusalem – with the second new temple – is still a city of half-ruined walls where people lived among the weeds and the rubble. In that year Nehemia – the deputy governor of the Persian king – decided to rebuild the walls around Jerusalem; walls that enclose and walls that exclude. During the construction, the weapons were ever ready to repel sudden attacks of opponents; trowel in one hand, sword in the other hand. After the building of the walls had finished, all the chosen people gathered one month later – in the seventh month of the year – near the restored Watergate. The chosen people asked Ezra – the high priest and scribe – to get the Torah including the law of Moses. Before the gathered crowd in Jerusalem, Ezra opened the Torah and everyone stood up. The native language of many of the attendees was Aramaic; during the reading of the Hebrew text of the law of Moses, the Levites  – the tribe of my ancestors  – gave explanation in order that the people understood the text. The next day Ezra, the Levites and Elders assembled to study the Law. They read that in the seventh month of the year, the chosen people had to build tabernacles. Hereafter the chosen people gathered foliage from the environment to build huts . A month later, the chosen people entered a new covenant with the One; a covenant that connects and a covenant that excludes. Herewith the chosen people promised to read these laws regularly and they committed themselves to maintain the covenant including e.g. the commandment to refrain from marriages with outsiders . This call of the chosen people to read the laws was a revolution in the ancient Near East, where usually the people were called by rulers to hear the power, the sacred majesty and the words of the local king, and to worship the king and his images. The worship of the chosen people was centred around scrolls with words; it was a worship without a king, and it was a covenant within the whole community of the chosen people with the One. Through this public reading, the old habit of loudly reciting the Torah at fixed times was restored and today this practice is still carried out by the chosen people . This iconoclasm of more than 2500 years ago is very similar to the iconoclasm of 1566 AC during the Reformation in the western part of the Netherlands. In 1566 AC on Walcheren in the dunes of Dishoek the first so-called “hedge sermon” [21 ] took place in the open air. From that moment, and the next few years many sermons had been held in the open air held by Protestants since overt religious practice outside the Catholic Church had been banned. Partly because of these sermons and the reading of the Bible itself – the Holy book given to chosen people by the One – created a mutual bond between believers. They would have experienced this as a worship without a king and as renewed covenant between the One and the whole community whereby they surely had read the book of Nehemiah about the covenant between the One and the chosen people 2000 years before. And still in Reformed families in the western part of the Netherland a next passage from the Bible is read at every meal; this usage is derived from the Reformation in the western part of the Netherlands, but it is also a result of the renewed covenant that the chosen people entered with the One more than 2,500 years ago”, says Man. “With this explanation of the iconoclasm from the Jewish history in relation to the iconoclasm in the Golden Age of Holland, you fulfil the role of the Levites again; the same role that your ancestors had fulfilled 2500 years ago. Obviously at that time this covenant had been a revolution as far as a commitment to the One concerned, but I have my reservations about the walls that enclose and the walls that exclude. A revolution that wishes to separate the elect from outsiders and/or dissenters is of all time. According to Bakunin , many revolutionaries become worse than the former ruler after a short time. How did this revolution of 2500 years ago via a renewed covenant with the One continue?”, asks Carla. “Nature flows where is cannot flow anymore. This also applies to my role as a Levite ; this certainly applies to the development and the continuation of the renewal of the covenant with the One. Less than a month later, a document of this covenant had been prepared containing a large number of provisions , including the names of the elect, marrying within their own circle, and exclusion of populations in the vicinity . In the western part of the Netherlands, the Reformation had followed a similar path . In London in 1550 AC the first Reformed church service had been held; in Emden in northern Germany a first Synod had been held; then in Dordrecht during the Eighty Years’ War– whereby several key persons could not be present – the two Synods of 1574 and 1578 AC had been held, and in Middelburg in 1581 and in The Hague in 1586 AC two other Synods had followed. These Synods had aimed at mutual agreement within the Reformed churches, but also to ward off foreign elements; also here walls that enclose and walls that exclude. During the pillarisation after the time of Napoleon, faith groups married in their own circles and lived in their own circles. During the school struggles in the 19th century there has been fought hard for freedom of education within their circles with an equal financial footing by the Government; this freedom of education – and equality in public financial contribution of private schools with public education – is enshrined in the Constitution of the Netherlands . Due to my life course, I could never feel at home at religious walls that enclose and exclude; I have always sought and found the interconnectedness – with hope and consolation  – of the many ways of religion”, says Man. 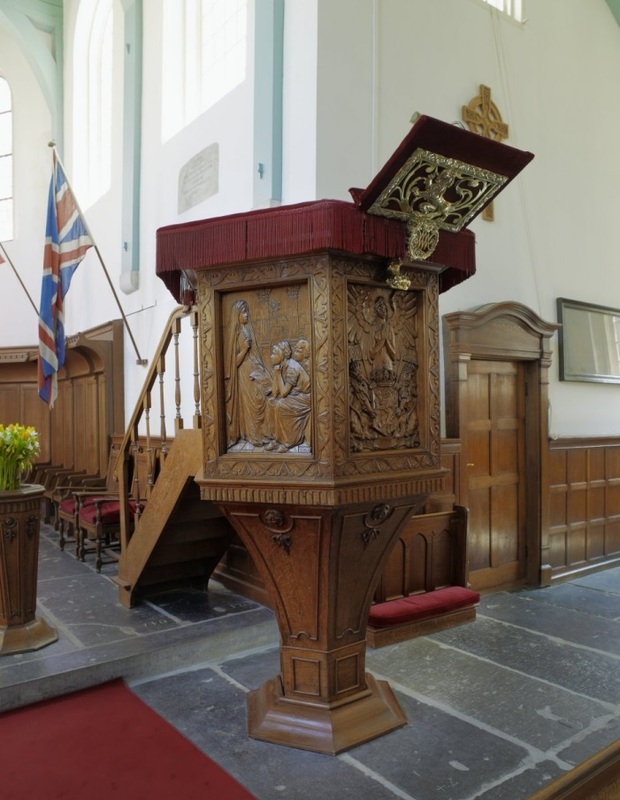 “Not intentionally, but intuitively I have asked you to visit this Begijnhof as a way of interconnectedness within the separation in history between Catholic Beguines and the English Presbyterian church in the Protestant area of Amsterdam”, says Narrator. “Shall we visit both churches?”, says Man. “That is good”, say Carla and Narrator. This entry was posted in Five, Five - Intensity and association and tagged Alteration, Amsterdam, Andrei Tarkovsky, Ark of the Covenant, Babylon, Begijnhof, Bible, Carla Drift, Catholic Church, Chaim Potok, Chosen people, Cordoba, de Stijl, Dordrecht, Eighty Years’ War, Emden, English Reformed church, Ezra, first tempel, freedom of education, Gerrit Rietveld, golden calf, hedge sermons, Iconoclasm, iconoclast, Jerusalem, Johannes Petrus Maas, Levites, Middelburg, moses, Nehemia, neoplasticism, One, people, Piet Mondriaan, pillarisation, pulpit, Reformed Church, renewed covenant, Sacred Heart statue, second temple, Simon Schama, Solomon, Synod, tabernacles, Tanakh, ten commandments, Theo van Doesburg, Torah, Word, Yahweh on 5 April 2014 by Jan van Origo. 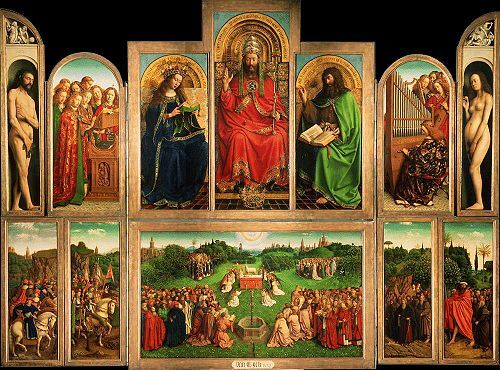 In the previous post we have looked at the painting the Mystic Lamb by the brothers Van Eyck in Ghent. 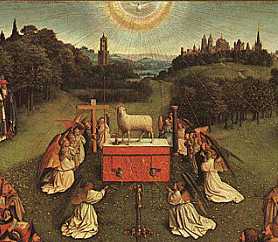 This painting shows the Lamb of God as an offering to take away the sin of the world. Jesus Christ, the only son of God the Father, is represented as Lamb of God . Above the Lamb of God, a dove is depicted as bright shining sun who illuminates the world. This dove symbolizes the Holy Spirit. Later in our Odyssey, you and I will dwell on “et incarnatus est”. During this post we consider the dove – the Holy Spirit – through whom Jesus as Son of God the Father is born out of Mary. For this we look one more time at the painting the Mystic Lamb by the brothers Van Eyck in Ghent. According to Christian theology God the Father, the Son and the Holy Spirit are a Trinity . In the painting, this trinity is depicted as a father – in the upper middle sitting on a throne as King-God – with thereunder a separate painting of the Holy Spirit as a shining sun that illuminates the world. Through the Holy Spirit the Lamb of God emerges as the only child of the Father. In this painting the Holy Spirit is painted as a dove. How does this divine trinity relates to the invisible Jewish God who is considered present between the tops of the wings of angels on the Ark of the Covenant? Do we see different physical appearances of the same God – who cannot be encompassed – but who takes different manifestations for the faithful? Is the invisible God who is considered present between the tops of the wings of the dove similar to the Jewish God who is considered present between the tops of the wings of angels on the Ark of the Covenant? Christian faith is spread through the Roman Empire. Within the world of the Romans, the father in the family has absolute power over his children. The birth of a Roman only takes places when the father decides whether and how the newborn child is included in society. Until a child is fully mature and starts living on her/his own, the father has absolute power over his children . In Western Europe the Catholic Church is a continuation of the Roman empire until now. Before 300 A. C. Jupiter is  the important Father God. The vestments in the church still show resemblance to the fashion of the Late Western Roman Empire  and the church provinces still follow the provinces of the former Roman Empire until now. Does “God the Father” show similarities with the father in the Roman Empire in respect to the powerful position over his children? “It seems that within the Christian theology the mystery of the divine Trinity is needed to reunite various forms of mysteries from the past. Through this unification of the Trinity and through rituals (with the usual offerings), the mutual trust between mankind and God is maintained according to the Christian faith. Through this mutual trust and faith, a view of a resurrection is created for the believers”, you say. “Your explanation sounds good, I leave a further investigation of this subject to church historians . The divine trinity, the world and the universe also fit perfectly within another metaphor for the mystery of life. The three manifestations of God, including the world and the universe fit perfectly within Indra’s net. Within this metaphor all aspect (including the three manifestations of God) are glass beads, that are more or less radiate and reflective. By their mutual radiation and reflection they constitute each other and together they shape the net. Within this metaphor a church is a community – with or without a building – that constitutes one another by mutual reflection arisen from beliefs, so that the life course is followed, “I say. “If we follow this way of thinking, the holy spirit may be the fleeting life course, light, wind, water, air, dust from which we are born and where we will return to. It also makes me think of the opening of the Ishvara upanishad which goes something like this: “That is the whole, this is the whole, from the whole, the whole becomes manifest; taking away the whole from the whole, the whole remains. Peace! Peace! Peace!““, you say. “There remain two questions. According to the metaphor of Indra’s Net, no single particle can get lost. And the second question arises because I’ve read somewhere that the gods are bound by the law of cause and effect. Maybe more on this later on our Odyssey”, I say. The following post is a transition to the next stage “Five” and is about the “Word “. See footnote at the post “Introduction: Three – Object in the middle – Lamb Gods” of 3rd June 2011. See post: Introduction: Three – Object in the middle – Part 1 of 5th May 2011. See post: Introduction: Three – Dubio trancendit of 28th April 2011. Source: Histoire de la vie privée. Tome 1: De l’Empire romain à l’an mil. Red. Ariès, Philippe & Duby, George. Source: Chapter 1 from Histoire de la vie privée. Tome 1: De l’Empire romain à l’an mil. The word Jupiter consists of the words Deus (or Dieu in French) that via the verb root “div” means “Shine, appear, increase”, and “ptr” meaning father. See also: http://nl.wikipedia.org/wiki/Geloofsbelijdenis_van_Nicea-Constantinopel. The doctrine of the Trinity – with the Holy Spirit as third Divine person – is not yet developed in the creed as established during the Council of Nicaea in 325 a.d. At the Council of Constantinople in 381 a.d. an adapted creed is agreed upon, in which the Holy Spirit is acknowledged as third Divine person next to the Father and the Son where the Holy Spirit comes from the father or “qui ex patre procedit”. The creed of Nicaea-Constantinople is accepted by all Christians. In 589 a.d. during the third Council of Toledo, “filioque” or “and the son” is added in the Latin text: the Holy Spirit emerges from the father and the son according to the Latin text. Charlemagne has been successful in ensuring that this addition is accepted by the German churches in 794 a.d.. Pope Leo III has sent a letter to Charlemagne in 808 a.d. mentioning that it is inappropriate to add “filioque” to the creed. Charlemagne has held to his position; he has not asked Pope Leo III to crown his son to Emperor. The creed in in the Roman Catholic creed still includes “filioque”. The Greek and Eastern Orthodox churches have seen this addition as a heretical degradation of doctrine of the Trinity, because this addition says that the Holy Spirit comes from the Father and the Son, and so is no equivalent God. In 1054 a.d. this addition has caused a schism between the Church of Rome and the Eastern Orthodox Churches. See also: Eliade, Mircea, A History of Religious Ideas, Volume 2. Chicago: The University of Chicago Press, 1982, p. 213-216. Studying this development two question arise. Why do Christians not accepted that the Trinity are three manifestations of one and the same where they arise together? Why do the father and the son not arise from the Holy Spirit if there is a need for a single origin? This entry was posted in Introduction, Three and tagged Ark of the Covenant, Brothers van Eyck, Catholic Church, Christian Theology, divine trinity, Dove, et incarnatus est, Father, glass beads, Holy Spirit, Indra's net, Ishvara upanishad, jewel, Johann Sebastian Bach, Jupiter, Lamb of God, Mary, Mass in B - minor, Mystic Lamb, Odyssey, Roman Empire, sacrifice, Son, sun, Trinity on 6 June 2011 by Jan van Origo.